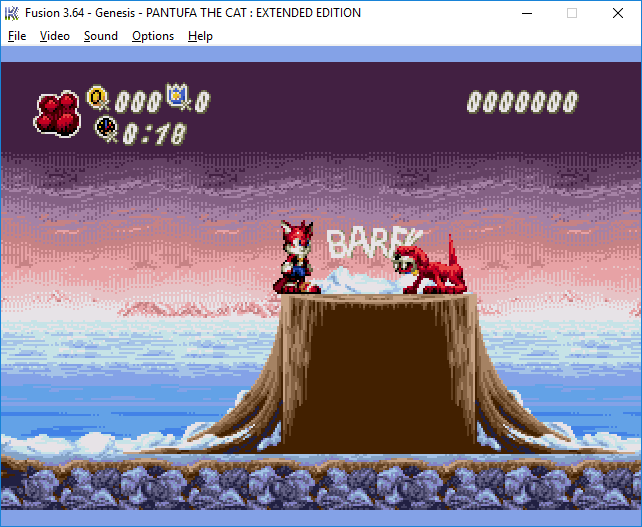 Pantufa the Cat : Extended Edition is a joke hack where you play as a Tails recolour. The main goal is to make a hack that plays and feels like yet another 90's mascot game that's trying to harness the hype of other mascots such as Sonic the Hedgehog. It is also meant to show that I've improved a lot since the original Sonic hack it was based on, Pantufa the Cat (do not play this unless you love subjecting yourself with more cringe, then again you did click to read a thread about a Fan Character in Sonic 1 hack). Just look at this garbage! Holding C before the level loads switches Soundtrack (basically the original OST for Pantufa the Cat (redone)) to give the hack a little bit of variety. Because the palette wasn't compatible I reshaded most of the Graphics, except some Scrap Brain Zone objects and Eggman. You will only start spinning when falling down, this means you're vulnerable when you start jumping. 3 Health points and Stackable shields, every 20 Coings heals you. Pressing any button while in mid-air make you do a special spin attack that gives you a very faint double jump, giving your jumps a longer horizontal range in exchange of vulnerability while not spinning. Give the same treatment as Pipes of Green (Pipe Green Place) got for the other levels. The Character select in the current version was originally meant as a joke, but I do consider adding GuimO and JP Boxart Bubsy. Yes this wasn't a joke, it will be implemented. -Pressing left and right repeatedly while on certain slopes makes you flip vertically. -Although there is no pushing animation, the push walk bug is still a thing and has a sillier side effect. -in Marble Zone act 1, if you do a specific jump to the right in the section with the stomper and the button, you may get the screen to scroll up and softlock the game. -You don't bounce up something when getting hit while on the ground. -"Yes - Roundabout" doesn't loop properly, and that's actually unintentionally (just like this typo). redhotsonic, NeoFusionBox, BinBowie and 11 others like this. Tried this during the contest week and I really like the feel of this. with so much of the physics being changed, as well as other small details [art, SFX, Etc.] made it feel more like it's own original game rather than a sonic game even with this being a hack. Looking forward to seeing more of this later on as this is one hack that peaked my interest quite a lot. Well I hope nobody minds if I drop the source over here. Calvin, Mr. Cat and FireRat like this. EMK-20218, Dandaman955, KCEXE and 12 others like this. I hope that dog's bark doesn't knock him off that tree stump. Then he'll be Pant-oof-a the Cat. Anyway, I love this game's art style. I've seen no other hack that looks this way. Looks like that dog played too much River City Ransom. Aside from that, looking good, just as always. I wanted to get more done than this, but I clearly misjudged my time. Bluestreak, Unlimited Trees and FireRat like this. Pff... that Pipes Of Green level was hard. After beating it I'd say that I hope it won't be included in the final. Also, the music glitches a lot in a winter level. It will be in the final, but only as an extra. That's the first I hear about any Audio glitches after the 50 or so builds I shared over discord, what exactly did you do to make it glitch up and what emulator are you using? When I kill an enemy, it sometimes makes a drowning sound and the music disappears. It actually does that same thing for me too when you hit any badnik. It only happens when I use fusion though. It works fine on hardware. i'm just gonna say that, although it might be a joke and i'm probably making myself look like an idiot, I don't like how you got rid of the twangy-ness from the Pipes of Green/Green Hill Zone alternate track. I sorta like it from the older versions. Might be just me though. Oh my od! You've finally added in your ame "Latios from Latios in Sonic The Hed eho 3"! I was waitin for this moment for years! I like this character. Mostly because you've added a chargeable Drop Dash. Hope to see him in the full version. Also, should I call him "MegaGwolf", "MeGaGwolf" or "Latios from Latios in Sonic 3"? EMK-20218 and redhotsonic like this. Due to lack of feedback and interest (mostly from myself) I have decided to put this hack on hold. This doesn't mean the project is dead but It's not active either, besides It has hardly moved past last SHC2016's Demo build. The fact it didn't meet the goal I had set for myself has discouraged me from working on it, and over time progress had slowed down so much that I honestly doubt if it's even worth finishing. With that said, putting this on hold will yield me more time for other projects I happen to be part of, and these are likely more worth finishing than the garbage I would have added anyway. In the end, it's one less joke hack for this year's contest and, in a way, it now lives up to it's subtitle! Calvin and ProjectFM like this. That extended edition joke tho. Oh God, I can't breathe. Still sad to see this hack go. It was a great and promising experience. Thats a shame, I really liked the art and overall uniqueness in this hack. It's really difficult to get any Music feedback and so far only three people were ever helpful. Blocks by the River - More of a Piano test than anything, it's a city setting much like the original's "River City Place"
A-S-H, Dragon Wolf Leo, Novedicus and 3 others like this. Was expecting to you put the song "Mamar Nos Peitos da Cabritinha" as well.